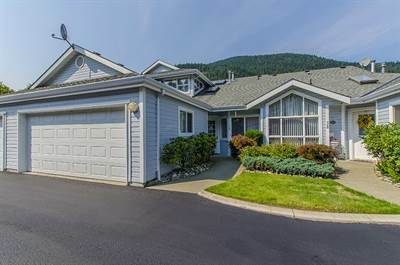 Harrison Hot Springs, Vancouver Coast & Mountains - Welcome to Desirable Harrison Lake Estates! A top notch 55+ gated community with A+ clubhouse & lovely grounds just short distance to the beach, boat launch, trails, golf course and tennis courts. You’ll find ALL YOU NEED ON 1 LEVEL HERE at an Enticing Price with BONUS LOFT AREA. An abundance of windows, skylights, 9' ceilings, plus high vaulted ceilings in the living rm/dining area makes this 1600+ retirement home Airy & Elegant. Extensive tile and laminate floors, corner gas feature fireplace, gourmet kitchen with convection oven and range with newer fridge, Bright Nook area, Bi vac and A/C. Ideal layout, large Mbdrm has 2 closets and 5 pc ensuite including sep. shower soaker tub and double sinks. Great Location in complex! *Well run strata, all roofs replaced and skylights done along with interior and exterior fencing redone.